Three 19-year-old friends of one of the alleged Boston bombers were charged Wednesday with trying to cover his tracks by throwing out fireworks and a laptop and then lying to US police. The three teenagers -- two Kazakhs and an American -- were fellow students at Dzhokhar Tsarnaev's university and appear to have been hastily trying to keep him out of trouble rather than taking part in an organized conspiracy. Dias Kadyrbayev and Azamat Tazhayakov were accused of conspiring to destroy a laptop and backpack containing fireworks belonging to Tsarnaev, while Robel Phillipos, an American, is charged with making false statements to police, AFP reported. The three are alleged to have tried to help Tsarnaev avoid arrest after seeing his picture on television three days after the April 15 Boston Marathon bombing, which killed three people and wounded more than 260 others. Tsarnaev is accused of carrying out the bombing with older brother Tamerlan Tsarnaev, 26, who is said to have masterminded the attack and was gunned down in a police shootout hours after the pictures were released to the media. Officials have said they believe the two ethnic Chechen brothers acted alone, but authorities are probing a six-month trip taken by Tamerlan to the restive North Caucasus region of Russia in 2012. According the formal complaint released by the Justice Department, Kadyrbayev texted Dzhokhar the night of April 18 after the images went public, saying one of them looked like him. Tsarnaev responded, texting "lol" (laughing out loud) and "you better not text me." According to the charge sheet he also told Kadyrbayev: "I'm about to leave if you need something in my room take it." The three friends then met at Tsarnaev's dormitory room on campus and watched a movie while waiting for him to return. Then they noticed a backpack containing fireworks that had been opened and emptied of their gunpowder. "Kadyrbayev decided to remove the backpack from the room in order to help his friend Tsarnaev avoid trouble," the charge sheet says, according to AFP. It adds that he also removed a jar of Vaseline he thought might have been used "to make bombs." "He decided to take Tsarnaev's laptop as well because he did not want Tsarnaev's roommate to think he was stealing or behaving suspiciously by just taking the backpack," it said. Kadyrbayev and Tazhayakov took the items back to their apartment, where they placed them in a black garbage bag and threw them into a nearby dumpster. 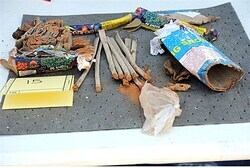 Police later recovered the items from a landfill. When police questioned the three over the next week, Phillipos initially said he did not remember going to Tsarnaev's room on April 18 and later said the three had gone there but left after no one answered the door. During a fourth interview on April 26, Phillipos "eventually confessed that he had lied to the agents during his previous interviews," and had been asked to go to the dorm room in a text from Kadyrbayev, the charge sheet said, according to AFP. Kadyrbayev's attorney Robert Stall told reporters the 19-year-old "absolutely denies" the charges, and disputed the allegations that Kadyrbayev immediately recognized Tsarnaev from the photos that were circulated. Kadyrbayev "assisted the FBI in this investigation," Stall said. "He is just as shocked and horrified by the violence in Boston that took place as the rest of the community." Tazhayakov's lawyer, Harlan Protass, said his client was "shocked" to hear of Tsarnaev's alleged involvement, adding that he "has cooperated fully with the authorities and looks forward to the truth coming out." All three suspects briefly appeared in court Wednesday in handcuffs to hear the charges read against them. Phillipos is due back in court May 6, while Kadyrbayev and Tazhayakov have a new hearing scheduled for May 14. Kadyrbayev and Tazhayakov, Kazakh nationals in the United States on student visas, face a maximum sentence of five years in prison and a $250,000 fine, the Justice Department said. Phillipos faces up to eight years in prison and a $250,000 fine. Tsarnaev, who is still hospitalized for gunshot wounds suffered during the police chase in which his brother was killed, has been charged with using a weapon of mass destruction and could face the death penalty. The release of the pictures of the two brothers kicked off a violent midnight police pursuit and a city-wide manhunt that paralyzed Boston.